Goblins and tiger and bears, oh my! So I've got my copy of 3d-Coat just about broken in. Still quite a few things to learn but for now I can use it to make assets. I've painted my first normal map and specular map. Hopefully it doesn't look terrible. I've also been informed by google video that they are removing all their videos. I imagine it's because they own youtube now. Not really sure though, so some of my videos will disappear from my blog. 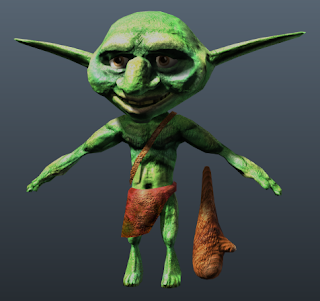 I uploaded a turntable view of the Goblin to my vimeo channel as well. You can check it out here, Goblin turntable. I've not forgotten about my short film, I just have 2 projects going on right now.